Yesterday we looked at the fastest men on the water, and now it’s time to sign off on season 2017 with a look at the leading ladies. It was a big year for women’s racing. Several athletes started hitting the podiums for the first time to inject some fresh storylines into an aging saga, while there was also that unmissable #ipaddleforequality movement in October. 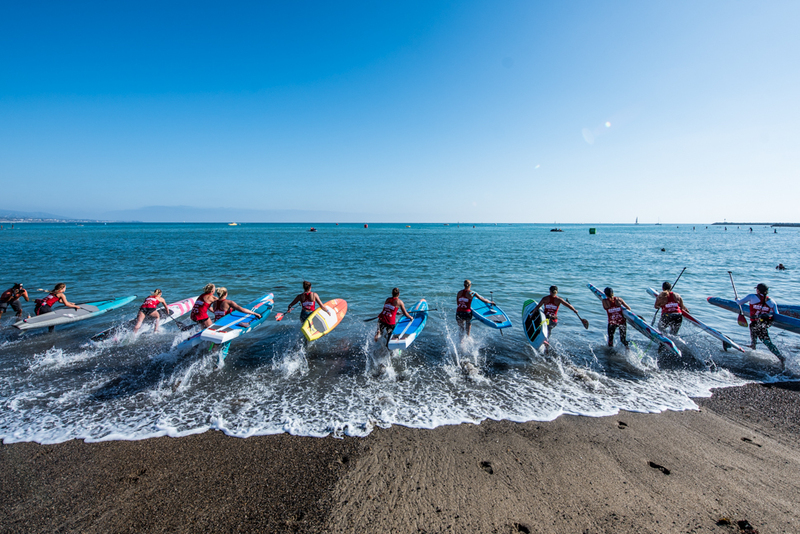 The hashtag aims to give women a more equal share of the prize money purse, and it briefly broke stand up paddling’s little corner of the internet. For all the positives, there are still plenty of issues to resolve: The ratio of men-to-women competing at the top end is still a disastrous 4-to-1, while we still need to encourage more junior girls into the sport if the women’s side of SUP racing is ever going to be a legitimate pursuit. Hopefully those things will evolve further over season 2018, but for now let’s take a look back at the fastest women on the water in 2017. Note: If the men’s field was difficult to accurately rate, the women’s was downright impossible. Some athletes had a big win but were rarely seen on the start line otherwise (see: Manca Notar), while many simply don’t have the same opportunities to travel and compete as the men. Keep that in mind as you read through a list that is something of a balancing act. An always-smiling member of the always-smiling Japan team, Yuka has followed the path of many of the top youngsters: start stand up paddling as a talented surfer then suddenly get bitten by the racing bug and go all-in. While she flies under the radar, Yuka was a fixture at the big events in Germany, Denmark, Australia and of course Japan this year. Still relatively young, and a star-in-the-making at home as the sport continues its somewhat meteoric rise in Japan, Yuka has a bright future for sure. Probably the most under-rated athlete on the women’s circuit, Lena didn’t get the opportunities to compete at enough international events to make the impact she could have, but the few glimpses we got of this Brazilian dynamo were more than enough to earn her a spot on the Top 17. The highlights of Lena’s year included a tough win at the torturous, rain-soaked 11 City Tour before a gold medal at the PanAm Surfing Games in Peru capped off a solid season. There was also a very respectable 6th-place finish at the first major of the season, the Carolina Cup. The fact Lena is sitting top 20 on the world rankings despite only holding three results pretty much sums up her potential. Let’s hope we see the Brazilian in more in season 2018. One of the most determined paddlers on the water, and one of the nicest off it, Susak is part of the European Army making their mark on the sport. Traveling the Continent (and the world) with her boyfriend and paddle partner in crime, Paolo Marconi, the Spaniard turned Tuscan-local is a fit, hard-working athlete that punches above her weight and never says no to an adventure. A string of fourth-place finishes on the EuroTour set the tone for a year that included mixing it with the big guns at the PPGs and a season-ending victory at the big Paris Crossing. Hard working Frenchwoman that’s gone from strength to strength over the past 24 months. Had to play second fiddle on Team France to the barnstorming Olivia Piana but still got plenty of time in the spotlight. An overall sixth on the EuroTour and a silver medal at ISA sprints in Denmark were a couple of the highlights. Like Susak above, Amandine is another athlete that travels and races with her partner–the equally hard working Boris Jinvresse. Still hasn’t reached her full potential, but that’s not really surprising when you consider Jade still can’t legally drink for another half a decade. The young gun from southern California has quietly been touted as a future world number one thanks to her sublime skills (does anyone in the women’s field have a smoother technique?) and confidence in the ocean. At a time when the sport is crying out for greater female participation, and with a relative lack of youth at the top of the table vis-à-vis the men’s circuit, Jade and her fellow super groms have been refreshing revelations over the past year or two. Picked up a medal for Team USA at the sprints in Denmark and absolutely smashed the Pro Junior division at the PPGs. Has showed more than enough talent to suggest a much higher rating on the Top 18 of 2018. Another of the “work horse” crew, April always manages to get the job done with a minimum of fuss. Finishing fourth at her home town major, the Carolina Cup (which was quite symbolically held in April) the Hobie team rider never seems to get the kudos of the top 10 women despite regularly matching it with them. With an Instagram full of workout vids, you’ve got very little chance of beating April Zilg with grit alone. Becoming more and more proficient in the surf, you could easily argue April deserves a spot inside the top 10, and you’d feel pretty confident if you bet on her being there in 2018. Managed a 5th at Carolina and an overall top three finish on the EuroTour. Still finding her feet in the ocean but an absolute beast in the flats, especially on the longer events (a multi-time winner of both Chattajack and the 11 Cities). Supremely fit and not lacking determination or self-belief, Seychelle is always a podium threat. Runner-up to Annabel at the Battle of the Bay was another season highlight for the East Coast’s top-ranked athlete. Recently joined the Paddle Monster team as coach alongside the likes of Larry Cain and Travis Grant. Seychelle is also pretty handy on a yoga board. How much weighting do you give one event? Penelope Strickland won what is arguably the most prestigious race on the planet: Molokai-2-Oahu. And she didn’t just win, she smashed it, finishing half an hour ahead of Kiwi compatriot world number one Annabel Anderson in one of the great upsets of recent times. It was without a doubt one of the top performances of the year on either side of the gender aisle. But apart from Molokai, Penelope’s season was a little thin. Some events she chose to race prone, while other events she chose not to race at all (at least not on SUP: Pea doesn’t mind a bit of old-fashioned prone racing). Another of the real “battlers” in the sport, Pea exits season 2017 sans sponsor, which means we may or may not see the tough Kiwi on the water in season 2018. If we don’t it’ll be a shame, because like many of the other women that punch above their weight, Penelope added fresh vigour to the sport this year. Her plans and her team home for season 2018 aren’t set, but if and when she does get on the water, this woman is a weapon — especially anything in the rough and tumble of the ocean. To suggest Annie and her friends carry the weight of the women’s sport on their shoulders would be a little unfair, but it’s impossible not to smile when you consider the potential of this Maui-based wunderkind. It doesn’t hurt that Annie carries herself with absolute pedigree off the water. She’s part of a now-very small Team Naish, which will only help her profile given the brand’s prestige combined with its lack of team riders. Represented Team Hawaii at the Worlds in Denmark, though it was a third at the Gorge’s prestigious “Double Downwinder” that cemented Annie’s top 10 spot on the end-of-season world rankings. A top five berth and beyond is surely just a matter of time for this young athlete that seems to feel right at home in the ocean. This is a tired but very happy smile after today's double downwind race 😜 I'm still a bit shocked with a third place finish amongst the world's best paddlers! I'm inspired by the talent and drive of the field of elite women and grateful for an amazing day of racing. Congratulations @fiona_wylde and @annabelanderson for your impressive finishes and huge thanks to @naishsup for the fastest boards around!! 🚀🙌🏼 #naishsup #naishmaliko @mfchawaii #mfchawaii @pakalohabikinis #pakalohabikinis @officialmauijim #mauijim // Thanks for the shot @michisilence !! Australia’s long-serving and hard-working veteran, Angie had a relatively light travel schedule this season but when she was on the water, she was on fire. While she settled for a 4th place in the Double Down behind Fiona, Annabel and Annie, her second run included an epic duel with the world number one that almost went the way of the Aussie. Finished the season with a massive victory at the King of the Cut in West Oz, which well and truly cemented her status as one of the best downwind women in the world. Finds time in between training and racing to grow the new boutique brand, ONE, along with husband and sparring partner Paul “Jacko” Jackson. By her own lofty standards 2017 was probably a bit of a quiet one for Candice Appleby, the original queen of SUP racing that still holds the most BOP/PPGs titles (by a healthy margin). Finished 5th on the EuroTour despite only racing twice, but relinquished her Pacific Paddle Games title after a weekend where Candice would be the first to admit she wasn’t on point. Clearly still one of the world’s best on her day, and with the new role of mentoring the next generation (see: Foudy, Howson), Candice still has a long career in this sport both on and off the water. Never one to shy away from a challenge, Applesteeze will no doubt be ready to attack the 2018 season and regain her top-tier status. A few months ago I didn’t expect Shae would even rate on our Top 17 of 2017. With a frustrating injury keeping her off the water for the first seven months of 2017, it wasn’t until a brief appearance at the Gorge in August that we were reminded just how talented this SoCal youngster really is. Fourth at the Gorge beach race was followed by an even more impressive result, third at the almighty Pacific Paddle Games, a result that solidified her standing as one of the fastest women on the water and did more than enough to earn her a spot in the top half a dozen on this year-end list. If she’s fit and firing in 2018, you can bet on Shae Foudy finishing even higher on the next power rankings. Has the honuor of being the biggest mover between the end-of-season world rankings (16th) and the year-end best-of list (6th). Terrene Black never really seems to make the impression of some of the other top-ranked athletes in our sport, but perhaps that’s her ultimate weapon: she flies well beneath the radar, and you won’t know she’s a threat until it’s too late. Stood on countless podiums in season 2017 but didn’t attain the consistency she would have liked. Has the talent and raw strength to match it with anyone on her day, but perhaps also lacks the motivation to be number one in a sport as small and fickle as SUP racing. Either way, Terrene finishes the year as the top ranked Aussie and will no doubt be a top-ranking contender in season 2018. The powerful German lost her coveted Molokai title without a fight this year – Sonni skipped the event – but still showed more than enough during the rest of the season to warrant a top placing on the Top 17. Sonni’s highlight was probably the front half of the EuroTour, where she stacked up win after win en route to third-straight title. When it’s a test of raw strength and skill, there are very few women who can stay withing shouting distance of Sonni Honscheid. Combine that with her love for and affinity with the open ocean, and I’d say Starboard’s artist-in-residence will have plenty more years on the podiums. Doesn’t hurt that she has one of the biggest sponsors of any athlete in the sport: Mercedes-Benz. A few years ago, Olivia Piana seemed to have disappeared from the world of stand up paddling. One of the original queens of SUP racing (she won a pair of silvers at the inaugural ISA Worlds in 2012), Olivia drifted in limbo after suffering injury, a loss of sponsorship and a seeming loss of motivation. But about 24 months ago, something snapped. Over the past two seasons, Olivia hasn’t just regained her form, she’s reached heights previously reserved for paddling royalty. The highlight of her season was definitely a runner-up performance on the grand stage, the Pacific Paddle Games, but everywhere you look there were solid results. Third at Carolina, a virtual tie with Sonni on the EuroTour (she won just as many summer events as the champ – three – despite settling for second). There was also a silver (beach race) and bronze (marathon) at the Worlds in Denmark, just for good measure. Anyone that beats the undisputed world number one by over five minutes can’t possibly be rated any worse than second on our year-end best-of list. That was Fiona Wylde’s margin over Annabel Anderson during the first half of the Gorge Paddle Challenge “Double Downwinder” showdown in August. Fiona didn’t just win at the Gorge, she destroyed one of the most competitive women’s fields ever assembled. Yes, her hometown advantage helped, but don’t let that take away from one of the most dominant performances of the year. Her victory in the third major of the season ranks alongside her runner-up performance in the first, the Carolina Cup, while a couple of medals in Denmark helped further fill an ever-growing trophy cabinet. The fact this pocket rocket beats most of the world while dealing with type 1 diabetes only adds to her pedigree. A leader not only on the water but off it – Fiona has been absolutely instrumental in rallying the athletes behind common causes over the past six months – this humble Oregonian has well and truly earned her spot in the sport’s elite despite not even having celebrated her 21st birthday yet. Starting work on the women’s top 17 of 2017 last week was pretty easy: I put Annabel Anderson at number one and then started thinking about everyone else. The fact that Annabel is number one on our year-end best-of list (yet again) is absolutely no surprise, but her shoe-in victory shouldn’t take away from just how hard this work horse grinds away to stay above the competition. A tenacious competitor with a tough shell that can easily be misunderstood as either arrogance or iciness, Annabel is really just a battler at heart, boldly taking on the world of racing this year as a “free agent” and winning. Again and again and again. Annabel finishes the year as a “unicorn” – a member of the mythical 300+ points club – something not even she has ever achieved in the past (Connor Baxter also crossed the magic mark this season). That massive points haul – Annabel is almost 100 points clear of second place – comes courtesy of an incredible fifth-straight Carolina Cup crown and a maiden Pacific Paddle Games title. Sure, there was that third-place finish at Molokai–an M2O podium would be a dream for most other athletes, but for Annabel a disappointment. The world number one couldn’t match Fiona at the Gorge Double Downwinder, either, but they were the only real beats she skipped. There was that clean sweep of the main events in Denmark, a couple of victories in Hawaii (OluKai and M2M) and a bullet win up at the Battle of the Bay in San Fran just for good measure. Annabel also found time to spearhead the #ipaddleforequality movement. At some point Annabel will probably get tired of being on top, the only question is whether any other woman can genuinely challenge her before she walks away. We eagerly await to see if anyone can step up to the plate in season 2018, but no matter what happens, Annabel has pretty much sealed her status as the GOAT.